1. Which of the following is the shortest valid abbreviation for FE80:0000:0000:0000:0 010:0000:0000:0123? Inside a quartet, any leading 0s can be omitted, and one sequence of one or more quartets of all 0s can be replaced with “::”. The correct answer replaces the longer three-quartet sequence of 0s with ::. 2. An ISP has assigned prefix 3000:1234:5678::/48 to Company1. Which of the following terms would typically be used to describe this type of public IPv6 prefix? The name of the prefix generally represents the group to which the prefix is given, with the exception of the term global routing . IANA assigns a prefix to a registry (registry prefix). The registry can assign a subset of that range as a prefix to an ISP (ISP prefix). That ISP then subdivides that range of addresses into prefixes and assigns a prefix to one of its customers (site prefix, also called global routing prefix). The enterprise network engineers then further subdivide the range, often with prefix length 64, into subnet prefixes. 3. A laptop inside your network has an IP address of 10.1.1.241. Using NAT, a router translates the 10.1.1.241 private IP address into 198.51.100.54, a public IP address, as the laptop is connecting to a web server on the Internet. The web server has an IP address of 203.0.113.10. What type of address is 10.1.1.241 in this scenario? An outside global address represents a device outside of a network with a globally routable address. In this scenario, the web server’s IP address of 203.0.113.10 would be an outside global address. An inside local address represents a device inside of a network with an address that is not routable on the public Internet. In this scenario, the laptop’s IP address of 10.1.1.241 would be an inside local address. An inside global address represents a device on the inside of our network with an address that is a globally routable address. In this scenario, the laptop’s translated address of 198.51.100.54 would be an inside global address. An outside local address represents a device on the outside of a network that has an address that is not routable on the public Internet. For example, if NAT were being performed at a remote site, the destination device at the remote site would have an outside local address. In the scenario presented in this question, there is no outside local address. 4. A laptop inside your network has an IP address of 10.1.1.241. Using NAT, a router translates the 10.1.1.241 private IP address into 198.51.100.54, a public IP address, as the laptop is connecting to a web server on the Internet. The web server has an IP address of 203.0.113.10. What type of address is 203.0.113.10 in this scenario? 5. Class C network 200.1.1.0/24 was allocated to an ISP that operated primarily in Asia. That ISP then assigned this entire Class C network to one of its Asian customers. Network 200.1.2.0/24 has yet to be assigned to any ISP. Which of the following is most likely to be true? 200.1.2.0/24 could be assigned to any registrar or ISP in the world. 200.1.2.0/24 will be assigned in the same geography (Asia) as 200.1.1.0/24. 200.1.2.0/24 cannot be assigned as public address space. Routers inside North American ISPs increase their routing table size by 1 as a result of the customer with 200.1.1.0/24 connecting to the Internet. ICANN and IANA manage the assignment of public IPv4 address space such that large address blocks (often called CIDR blocks) exist in a particular geography or are assigned to particular ISPs. As such, Internet routers can more easily create summary routes to help keep the routing table small in the Internet. 200.1.2.0/24 would likely also be allocated to some registrar, ISP, or customer in Asia. Because of the large route summaries, in this case possibly a summary for 200.0.0.0/8, routers in North America would not see an increase in the size of their routing tables. 6. Which of the following statements is true about a router’s eBGP peers that is not also true about that same router’s iBGP peers? The eBGP peer neighborship uses TCP. The eBGP peer uses port 180 (default). The eBGP peer uses the same ASN as the local router. The eBGP peer updates its AS_PATH PA before sending updates to this router. The question asks which answers are true about the eBGP peer but also not true about an iBGP peer. Both iBGP and eBGP use TCP port 179. An eBGP peer uses a different ASN than the local router, by definition, making that answer incorrect. The correct answer refers to the fact that an eBGP peer adds its own ASN to the BGP AS_Path PA before sending routing information to another router, whereas iBGP peers do not. 7. Enterprise Router R1, in ASN 1, connects to ISP Router I1, ASN 2, using eBGP. There are two parallel serial links between the two routers. The implementation plan calls for each router to base its BGP TCP connection on its respective loopback1 interfaces, with IP addresses 1.1.1.1 and 2.2.2.2, respectively. Which of the following commands would not be part of a working eBGP configuration on Router R1? Three of the commands list valid commands. The neighbor 2.2.2.2 multihop 2 command is syntactically incorrect; it should be neighbor 2.2.2.2 ebgp-multihop 2 . 8. 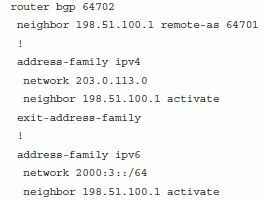 The following output, taken from a show ip bgp summary command on Router R1, lists two neighbors. In what BGP neighbor state is neighbor 1.1.1.1? The show ip bgp command lists the BGP neighbor state in the last column of output, listing the literal state, unless in an established state. In that state, the output lists the number of prefixes learned from the neighbor, so a numeric value implies an established state. The output lists R2's local ASN as ASN 11, a value that is configured in the router bgp asn command. The line for neighbor 1.1.1.1 lists that router's ASN as 1, so a neighbor 1.1.1.1 remote-as 1 command should exist on R2 instead of the neighbor 1.1.1.1 remote-as 11 command. The state for neighbor 1.1.1.1 lists "Idle (Admin)," implying that the neighbor 1.1.1.1 shutdown command has been configured. The other answer lists a nonexistent command. 10. The following output occurs on Router R1. Which of the following cannot be determined from this output? The "Known via" text refers to the local router's (R1's) router bgp command, which identifies the local router’s ASN. The rest of the output does not identify the neighboring ASN, nor the rest of the AS_Path details. It does list that the route is external, with the text "type external" and the AS Hops (which is the AS_Path length). 11. The following output occurred as a result of the show ip bgp command on Router R1. The output shows all BGP table entries on R1. 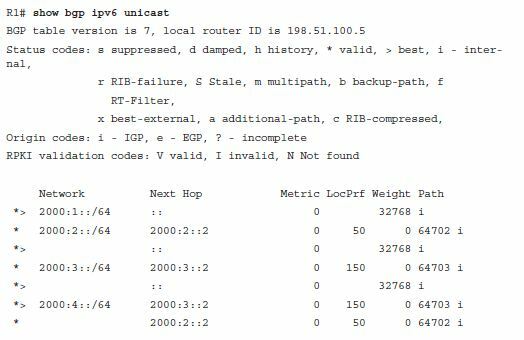 How many iBGP-learned routes exist on this router? The small letter "i" in the third character position implies that the route was learned with iBGP. Of the five lines, four have an "i" in the third column. R1 has a neighbor 1.1.1.1 command configured. R1 has a neighbor 2.2.2.2 command configured. The show ip bgp command lists a line for 190.1.0.0/16 with both an > and an i on the left. R1 is in ASN 1. The line reading “1.1.1.1 from 2.2.2.2...” implies the BGP RID of the neighbor is 1.1.1.1, with neighbor ID—the IP address on the local router’s neighbor command—of 2.2.2.2. The end of the output shows that the route is internal (iBGP learned) and is best, so both the > and i will be displayed for this route by the show ip bgp command. Finally, the output does not identify the local ASN, although it does list the AS_Path of the route (1, 2, 3, 4). 13. R1 is currently advertising prefixes 1.0.0.0/8, 2.0.0.0/8, and 3.0.0.0/8 over its eBGP connection to neighbor 2.2.2.2 (R2). An engineer configures a prefix list (fred) on R1 that permits only 2.0.0.0/8 and then enables the filter with the neighbor R2 prefixlist fred out command. Upon exiting configuration mode, the engineer uses some show commands on R1, but no other commands. Which of the following is true in this case? The show ip bgp neighbor 2.2.2.2 received-routes command lists the three original prefixes. The show ip bgp neighbor 2.2.2.2 advertised-routes command lists the three original prefixes. The show ip bgp neighbor 2.2.2.2 routes command lists the three original prefixes. The show ip bgp neighbor 2.2.2.2 routes command lists only 2.0.0.0/8. 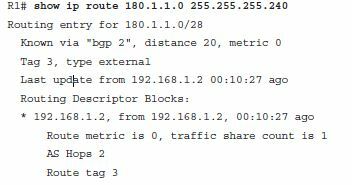 The show ip bgp neighbor 2.2.2.2 advertised-routes command lists only 2.0.0.0/8. The show ip bgp neighbors 2.2.2.2 advertised-routes command does list the post-outbound-filter BGP Update; however, the user did not issue a clear command, so the filter has not yet taken effect. As such, the output still lists the original three prefixes as if the filter had not yet been applied. Weight, a Cisco-proprietary feature of BGP on Cisco routers, cannot be transmitted in a BGP Update, so setting Weight on an outbound route map at the ISPs will have no effect. Also, the goals call for setting Weight for all routes from an ISP to the same number, so creating a prefix list to match a subset of reachable prefixes, in this case all Class C networks, is not useful. However, two methods of configuring Weight do exist: the neighbor weight command and configuring an inbound route map with a set weight command in the route map. 15. An enterprise router, Ent1, displays the following excerpt from the show ip bgp command. Ent1 has an eBGP connection to an ISP router with address 3.3.3.3 and an iBGP connection to a router with address 4.4.4.4. Which of the following is most likely to be true? The enterprise likely uses ASN 1. The neighboring ISP likely uses ASN 1. The route has been advertised through ASN 1 multiple times. Router Ent1 will add another ASN to the AS_Path before advertising this route to its iBGP peer (4.4.4.4). The output shows the results of AS_Path prepending. The repetitive 1s cannot mean that the route has been advertised into and out of the same ASN repeatedly because loop prevention would have prevented such an advertisement. With AS_Path prepending, the neighboring ASN typically adds its own ASN to the end of the AS_Path (as listed on the left of the output). 16. The following line of output was gathered on enterprise Router Ent1 using the command show ip route . Which of the following answers is most likely to be true, based on this output? This router has set the Weight of this route to 10. This router’s MED has been set to 10. This router’s BGP table lists an AS_Path length of 10 for this route. The command lists the administrative distance as the first number inside the square brackets and the MED values as the second number in brackets. The AD of 20 implies an eBGP route instead of iBGP. The output says nothing about the Weight or AS_Path length. 17. Identify the command used to create an IPv6 default static route. The ipv6 route ::/0 next_hop_ipv6_address command is used to create a default static IPv6 route. Your BGP neighbor has a similar configuration. You notice that IPv4 routes are being successful exchanged, but IPv6 routes are not being exchanged. What is missing from the above configuration? You need an IPv6 ACL to match the routes to be advertised. You need a route map that specifies a local next-hop IPv6 address to advertise to a neighbor. You need a neighbor statement that references an IPv6 address. You need an additional BGP AS for IPv6. When configuring IPv6 routing over an IPv4 BGP session, you need to create a route map that specifies the local router interface’s IPv6 address as the next-hop IPv6 address to advertise to its neighbor. However, this step is not a requirement when configuring IPv6 routing over an IPv6 BGP session. The only valid options after ipv6 prefix-list LIST1 seq 10 permit 2000::/16 are le (meaning less than or equal to) and ge (meaning greater than or equal to). The number of bits in the prefix length then follows those options. 20. Given the following output, determine why BGP chose 2000:3::2 as the best next hop to reach the 2000:4::/64 network. The AS path length and weights are the same for both next hops. However, the next-hop IPv6 address of 2000:3::2 has a higher Local Preference (150) than 2000:2::2 (50). Therefore, 2000:3::2 is chosen as the best next hop (as indicated with the ">" sign).